HARRY Styles has made a dying four year old girl's wish come true by contacting her family to chat about her after hearing how much she loves him. Fans pleaded with the One Direction star and his mum to contact Lancashire'a Jessica Whelan whose severe stage of neuroblastoma has ravaged her body. 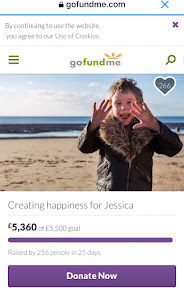 After doctors gave her just a few more weeks to live, Jessica's family and friends are trying to make her remaining time the best possible and after Nicki Jessica's mum revealed she was a huge fan of Harry's they appealed to him to help out. Family friend Chelsea Conlon from Oswaldtwistles said: "I was looking at doing something different. I asked Jessica's mum if there was anyone she likes or an idol. And the response was Harry Styles. It is a big ask, but it would be nice if he could. It'd put a smile on her face briefly, at least for a little while." 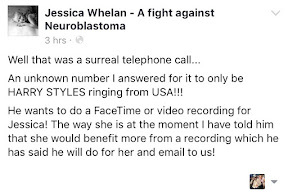 After Directioners and Harry Styles fans asked the star to help out, Jessica's mum received a call out of the blue from the man himself late last night at just before 9pm. She revealed last night (Tuesday) : "Well that was a surreal phone call. An unknown number I answered for it to only be Harry Styles ringing from the USA!!! He wants to do a FaceTime or video recording for Jessica! The way she is at the moment I've told him that she would benefit more from a recording which he has said he will do for her and email to us."